Over the past decade, single cell genomics has become a headlight and unavoidable approach to decipher neuronal networks and rare cells characterization such as neuronal stem cells and circulating tumor cells. More recently, improvements in NGS technologies and microfluidics have transformed the field of single cell genomics, and have widespread biological applications. The aim of this workshop is to give an overview of these powerful tools, how people can apply them to their research in Neurobiology and Oncology and promote collaborations. The workshop takes place on June 27-28th at ICM institute, Paris, registration is free and mandatory. 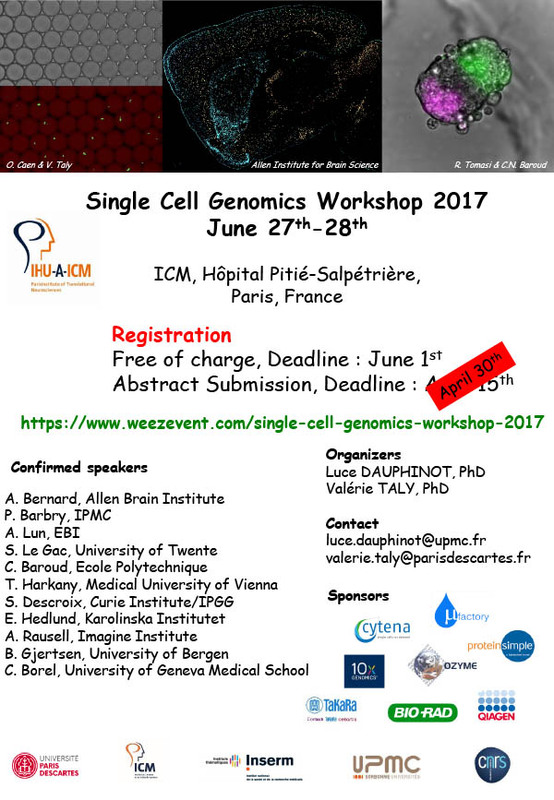 Register now for the Single Cell Genomics Workshop 2017. Contact us : Luce DAUPHINOT et Valerie TALY.